Swami Tarkeshwaranad Tirth of Jabalpur is one of the Swamis that I met in the beginning of this spiritual journey, though I did not see him frequently, yet he played a pivotal role in my journey. The first time I met Swamiji was in the year 2001 after the Allahabad MahaKumbh in Benaras. There he graciously invited me to his ashram in Jabalpur. Swami Tarkeshwaranand is a direct disciple of Swami Vishnu Tirth who was one of the most respected masters in his time and was well known in certain restricted circles. Swami Vishnu Tirth had travelled to US and other countries as well, but again was known only in restricted circles. He was the author of many books almost all of which were in Hindi except for ‘Devatma Shakti’ which was written in English. 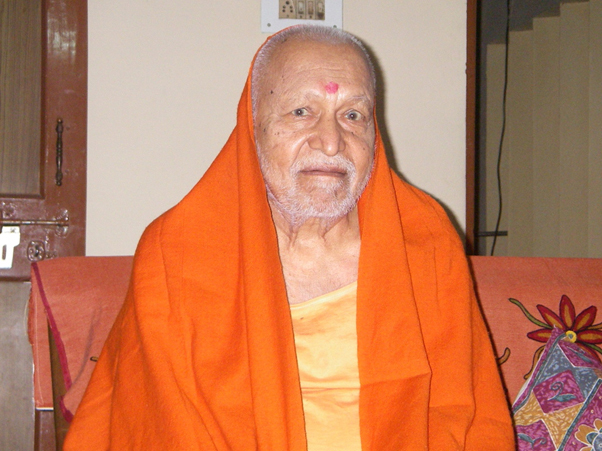 This lineage is the main Lineage of the ‘Shaktipat’ tradition (similar to Swami Muktananda’s Ganeshpuri lineage) and has remained very closed and restricted. This lineage has the maximum number of monks and sadhaks of the shaktipat tradition and yet is the least publicized. I bring up Swami Tarkeshwaranand’s name because it he who set many benchmarks for me on the spiritual path. One of the things that he had explained to me was that the Guru is like a transformer between god and the human being. Since an average person cannot tolerate the unlimited million volts of energy that is god or that god possesses, so god created gurus, so that the guru could pass on a much lower voltage, say 220 volts much like a step-down transformer. It was again he who reinforced what I already knew, that the physical Guru is an instrument in the hands of god, that the guru is the aspect of god as grace. All this impressed my mind and among other things this lead to a much broader conceptual understanding of the Guru and Guru Force in comparison to the usual understanding that most common people have. This is not to say that the person who is your Guru is a mere instrument. To clarify, for the student the Guru should always be considered as a living, walking, talking god. Swami Tarkeshwaranand is very well versed in many forms of Tantra Sadhanas (here the word tantra means spiritual practices, mostly the practice of repetition of mantras, reading of textual practices, use of Yantra in worship and so on.) most of which he obtained from teachers who were legends. Commenting on everything that he had learned he said “The Guru sent me to learn various forms of prayer and sadhanas, perhaps my mind was complicated. I do not know why I had to learn so much” referring to numerous types of practices that he had performed and completed. One of the other concepts that he passed on to me was that the greatness of a sannyasi lies in his ability to remain unknown. After all a sannyasi is like a Lion, all he needs to do is roar and he will be heard, but to the contrary here it is the effort to withhold that roar, to remain almost anonymous that makes him great. He said “Great are not those who are known, but great are those sannyasis who remain unknown” echoing the thoughts and words of other great masters including well known saints like Swami Vivekanand. It was very interesting being with a Guru of the caliber of Swamiji. When I first met him in Jabalpur, his eyes were red like live burning coal or like the rising sun. Later, after a few months when I met him, his eyes had calmed down to the normal colour. When I asked him about the previous red colour of his eyes and the change, he said that it was due to the effect of the Kundalini in a particular position that the eyes had turned red. During the time that I was with him in the ashram he started explaining to me many different subjects. Some of these subjects were difficult for me to understand especially the Hindi and Sanskrit terms as I had studied more of English. This lack of my ability to understand these terms and many other things annoyed him and one day he rebuked me especially in context to my being a Brahmin by birth by saying “You do not know this, your father did not practice this nor did he teach you and so on, referring to some basic spiritual practices; but I had followed a somewhat different system”. Most people will understand how difficult it is to accept criticism, especially when your father is being rebuked along with you, but I realized that in his given position he was correct and accepted his rebuke as Prasad. (Since I write this article for your benefit, allow me to point out that acceptance of one’s own shortcomings along with the acceptance of the Guru as a well wisher, are the first steps in the process of spiritual transformation. On the spiritual path in our tradition this step is a major step on the path to success.) From amongst many things that he advised me to do, one thing that I followed particularly was his advice to learn different prayers. During our interaction over a few days, at one point, Swamiji had offered to initiate me into the shaktipat tradition saying that after the diksha I would be immediately able to initiate others into the shaktipat tradition. In the few days that I stayed with him I could feel my body starting to rotate in a movement of the Kundalini peculiar to the Shaktipat tradition. For me it was very intense, quite uncomfortable and generally intolerable. I understood that I was not ready for such a massive dose of energy transfer as well as the accompanying life style and that the rapid pace of change was going to be almost impossible to keep up with, both physically and mentally. (Here it is worthwhile pointing out that many persons look upon this energy transfer or initiation as some kind of game. It is important to understand that neither is the initiation a game nor a monk, a sannyasi and a guru a toy that one may buy as though he is some kind of specialty.) Swamiji too realized that. Then, it was he who directed me to Swami Shukdevanandji. If an initiation is real it will start a real change. The most important thing to understand is that spiritual energy is a dynamic energy that will start a process of change. Unfortunately, most people, especially westerners do not really comprehend this process. You cannot have your cake and eat it too. A real initiation will start a change and one has to let go of the old habits and circumstances and adapt to a new life. If you cling to your old life and you wish to have this spiritual power, then it will only be possible if you are already in a very clean spiritual state. Otherwise, one will have an internal conflict that will end only in, either the removal and destruction of this spiritual energy that your Guru gifted you or you will end up doing some of those negative deeds with even greater negative impact on yourself as well as damaging and lowering your own spiritual and mental state than the initial one. I would like to point out that at one stage there is destruction of inhibition often with the feeling of euphoria of unparalleled freedom. Most frequently it is accompanied by the fulfilling of many wishes. This is only a temporary or initial positive sign from prakriti (or mother nature). For westerners and modern Indians often this converts into a sexual freedom where those who you want appear and wishes start getting fulfilled. At this point if you chase your desires you will become spiritually doomed and if you survive it will be with really big spiritual losses. This is one point where you need the support and guidance of the Guru which will be possible only if you have surrendered to the Guru and in even rarer cases one may survive due to the spiritual merits of past lives. Swami Tarkeshwaranand has Vak siddhi meaning whatever he says has the power of turning into reality. That makes him and similar sannyasis with similar powers, perhaps for lack of another term I will use the term -- dangerous. The next time I saw him he again reprimanded me and told me to go and live in the forest. I later came to realize that this was part of the reason for my long period of sadhana spent in the forest. After that I spent about two years in the forest with Tatambari baba. A very good experience but, it completely ruined my body and health, though, spiritually it was very rewarding. Another one of my very dear master’s, Swami Hariharanand Bharti had similar power, to add to this Swami Hari loved to joke. Usually, I would stop Swami Hari from joking since it scared me. Actually, I suppose it is the same with all siddh’s (perfected masters), they all have strong will power (Iccha Shakti). I have tried to explain the term willpower in the spiritual context in my article Iccha Shakti. In this article the example that I give of the Guru and shishya who were travelling together when the fire broke out refers to Swami Vishnu Tirth and Swami Tarkeshwaranand Tirth.